Getting into and out of bed, as well as staying in their bed while asleep, can become more difficult as a person ages. As a leading provider of home care services for seniors, we share with the people that we visit and their families that there are a number of reasons for this phenomenon. For example, diminishing eyesight can make it difficult to see the landmarks we all use to orient ourselves. Decreasing balance, either naturally with age or due to the medications a senior is taking, can be a factor as well. So can recent illnesses or conditions such as a stroke. Plus, the increasing frequency of trips to the bathroom increases the opportunities for a fall. Here are some tips seniors and their caregivers can use to help make their time in bed, or getting into or out of bed, safer. A senior who begins having difficulty staying in or navigating to/from their bed should talk with their doctor to see if an undiagnosed medical condition or improper medication dosage is playing a role. 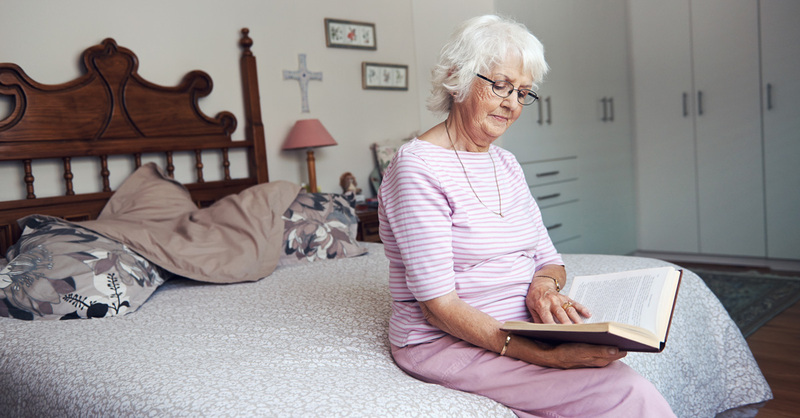 If a senior is falling out of bed while asleep, physical measures such as a lower-height bed or bed rails that can be raised and lowered may be necessary. Adequate lighting is important. It should be easy to access while lying in bed, and capable of properly illuminating the room without being blinding to a senior who is trying the find their way. The floor between the bed and door should be kept clear of obstructions and tripping hazards at all times, especially at night. A senior’s nightgown or pajamas should not pose a tripping hazard. In the event that a senior does fall from bed or while getting into or out of bed, a call device should be within reach so they can summon help if needed. Because a senior may spend most of their time in their bedroom asleep, it can be easy to overlook navigation-related issues. However, when you turn your focus to that space, the risks will likely be readily apparent. Our home care providers can certainly let a person they are visiting know if they see anything in the bedroom that seems to pose a danger. Contact us today to learn more about why we’re a leader in home care services in a free consultation! We’re honored to provide quality care for seniors by seniors in Fort Collins, Loveland, Greeley, Longmont, Johnstown, Berthoud, Ault, Firestone, Wellington, Windsor, Frederick, Laporte and surrounding areas.